Arimar's classical riding vacation programs emphasize lightness, balance, and relaxation for both horse and rider. Riders of all ages and skill levels are welcome at this training and teaching facility. You'll ride wonderfully trained horses and learn correct classical dressage techniques, while in the beautiful natural surroundings of the Kettle Moraine State Forest. 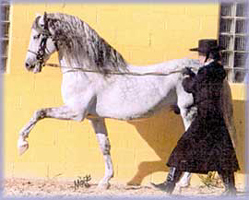 The clinics provide a foundation in classical dressage for both horse and rider. Our program consists of 2 lessons per day (more are available to those who wish) and unlimited auditing of other horses and lessons. You'll have the opportunity to ride upper-level school horses whose temperaments and level of ability are a good match for your own. If you prefer, you can bring your own horse along, and you can learn together. You can enjoy the ambience of our large farmhouse with your own separate upper-level entrance and private bedroom. Gaze at the Kettle Moraine Forest from the patio window in the living room. The attached outer deck overlooks the in-ground swimming pool. It's a beautiful place to stay in a quiet country setting. If you want to take a break from horses, the nearby Kettle Moraine Forest offers a variety of recreational activities, from hiking, biking, camping, swimming, fishing, snowmobiling, cross country skiing and much more. We're also located just a few minutes from "the Wade House," a former stagecoach inn which has been restored and houses the Jung Carriage Museum featuring more than 70 vehicles in one of America's finest carriage collections. Many special equine activities take place regularly at the Wade House, such as Draft Horse Exhibition, Civil War Re-enactments and Buffalo Bill's Wild West Horse Show. It's great fun for the whole family. Also close by are "The Shops at Woodlake" in Kohler, WI. Many one-of-a-kind specialty shops are located here, along with the famous five-star luxury resort "The American Club" and "Whistling Straits" golf courses, host to the 2004 PGA championships. Weekend clinics cost $180 per day. This price includes lessons and lodging.